CORVALLIS, Ore. – Want to learn more about the Oregon State University College of Engineering’s far-ranging research efforts, including asking questions of those conducting the research? The college’s sixth annual Graduate Research Showcase on Friday, Feb. 8, provides that opportunity. 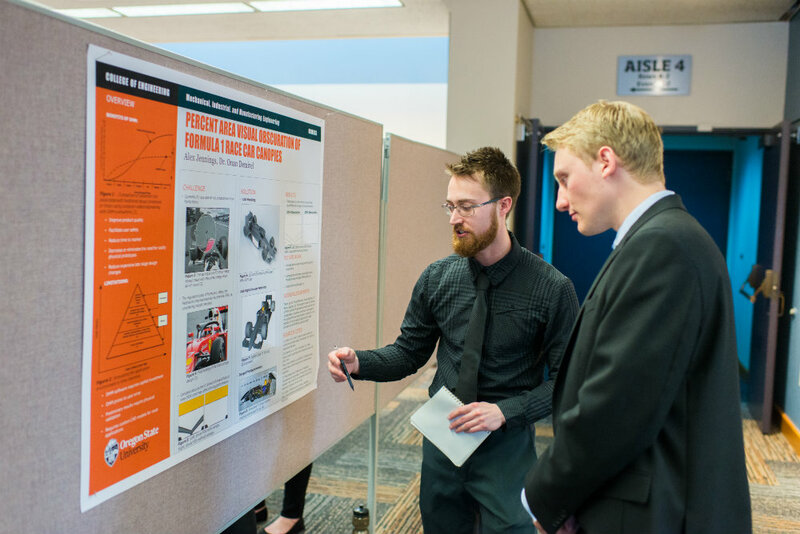 Engineering graduate students will give poster presentations from 1:30 to 4:30 p.m. at the CH2M HILL Alumni Center on OSU’s Corvallis campus, 725 SW 26th St. The event is free and open to the public. During those three hours, visitors are welcome to question the students about their work, which gives them valuable opportunities to further develop their communication skills. More than 125 students will display their research this year. Topics include: water purification, miniature electric grids, portable desalination units, atmospheric radiation detection, soft robotics and corrosion-resistant stainless steel. Vishvas Chalishazar was named the top presenter in electrical engineering and computer science at the last two showcases. He was honored for his work protecting Portland General Electric’s grid from earthquake risk. For more information, contact Brad Canfield, outreach programs and events manager for the College of Engineering, at 541-737-7151 or brad.canfield@oregonstate.edu.